Dynamic and static reconstruction procedures are employed for facial reanimation in patients suffering from facial nerve paralysis. However, dynamic strategies tend to be more successful and fruitful and should be offered to each patient considering reconstruction, unless health risk contraindications exist. Facial nerve denervation and paralysis imposes significant psychological and functional impairment. Facial paralysis can inhibit and mar facial expression, communication, symmetrical smile, eye protection, and oral competence. Myriad modalities and stratagems exist for each patient; the physician must accurately evaluate and examine the patient and determine the etiology, duration, and the scale of the paralysis. Understanding facial nerve anatomy with precise assessment of the patient's paralysis and health status dictates the potential for recovery and the most appropriate reconstructive scheme. The facial nerve innervates a total of 23 paired muscles and the orbicular oris, but only 18 of these muscles, working in a delicate balance, produce facial animation and expression. No current reconstructive stratagem can reproduce every facial expression and movement. The patient and the surgeon should thoroughly discuss the patient's expectations. As part of patient education, surgeons need to establish realistic expectations and determine whether the patient is willing to expend the time and financial resources required for a successful result. The precentral gyrus emits the voluntary motor portion of the facial nerve, where most of these nerve fibers cross in the pontine region to approach the facial nerve nucleus in the contralateral pons. 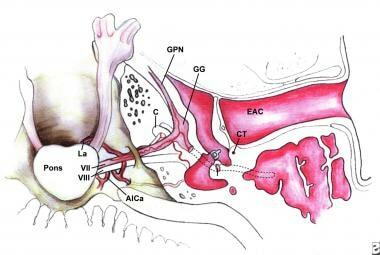 At the cerebellopontine angle (CPA), the facial nerve is near the nervus intermedius and the eighth cranial nerve. The first branch of the facial nerve is the greater petrosal nerve, which departs from the geniculate ganglion and is responsible for parasympathetic secretion of the nose, mouth, and lacrimal gland. The nerve to the stapedius is the next branch and arises from the proximal mastoid segment. The chorda tympani nerve emerges proximal to the stylomastoid foramen and carries parasympathetic secretory fibers to the submandibular and sublingual glands, as well taste fibers to the anterior two thirds of the tongue. Etiology is the most important factor in determining the timing and choice of reconstructive technique. Reconstructive efforts should not commence prior to establishing the etiology of the paralysis. Bell palsy, an idiopathic form of facial paralysis, is a diagnosis of exclusion. Eighty percent of patients with facial paralysis suffer from Bell palsy. (Trauma is the second most common cause of facial paralysis.) Eighty-five percent of these patients begin to recover nerve function spontaneously within 3 weeks of onset; the other 15% do not have any movement for 3-6 months. If the patient has Bell palsy, the potential for complete recovery is excellent, especially in incomplete paralysis. Peitersen found 94% of patients with partial paralysis completely recovered facial nerve function in 1 year without medical or surgical intervention; of those with complete paralysis, 71% completely recovered. Therefore, irreversible techniques to reanimate the face may not be the best choice in these patients. If a tumor is suspected, proper evaluation of the patient is of the utmost importance to appropriately treat the malignancy and choose the best reconstructive option. If paralysis is caused by a malignancy or is a result of resection for a malignancy, the risk of recurrence and prognosis may influence the choice of reconstruction. Malignancy of the posterior fossa, temporal bone, skull base, or parotid region can present with facial paralysis. The etiology of the denervation dictates the timing of surgical treatment, if any is to be done. In a patient with a paralyzed face secondary to traumatic surgical disruption, the surgeon should initiate reconstruction as soon as possible, generally within the first month. On the other hand, a patient with an intact nerve can be monitored for recovery for up to 12 months. The duration of the facial paralysis is essential. Evaluation of a patient with facial paralysis commences with a thorough and detailed history and physical examination. Keep in mind that the reconstructive options for acute paralysis, paralysis for less than 18-24 months, and paralysis for greater than 18-24 months differ significantly. A thorough history includes onset, initial degree of paralysis, duration, and associated symptoms. These details often can help to identify the etiology. Facial nerve injuries from Bell palsy, trauma, and malignant neoplasm need to be identified, with the reconstructive efforts and interventions based on the etiology of the disorder. For example, a slowly progressive paralysis suggests malignancy, while a sudden onset of complete paralysis suggests Bell palsy. The workup, treatment, and prognosis of these 2 disorders differ vastly from each other. In addition, the surgical team must investigate previous surgical procedures for reanimation, since these may limit reconstructive options. The patient's overall health, psychological stability, and life expectancy are significant considerations. Patients with significant health risks and medical problems are not appropriate candidates for invasive reconstructive operations, the results of which do not manifest for 2-3 years postoperatively. The surgeon must perform a comprehensive physical examination of the patient with facial paralysis, scrutinizing the face at rest and during voluntary and reflex emotional movement. The physician must determine the involvement of unilateral or bilateral facial nerves, facial asymmetries, and synkinesis. The degree of brow ptosis, ectropion, lid laxity, and oral competence must also be noted. The surgical team cannot neglect other cranial nerve or neurologic deficits and soft tissue defects in conjunction with the paralysis. Audiometric testing, including acoustic reflexes and tympanometry, may be useful in identifying the etiology of facial palsy secondary to retrocochlear pathology or mass lesions of the middle ear. High-resolution computed tomography (CT) and magnetic resonance imaging (MRI) scans are essential in the evaluation of a patient with traumatic facial nerve palsy to delineate features of the temporal bone, which may impact the facial nerve. Scans are also used to evaluate patients with possible parotid, skull base, temporal bone, intracranial, or extratemporal tumors. Electrodiagnostic tests of facial nerve function include nerve excitability tests (NET), electroneuronography (ENog), and electromyography (EMG). Nerve excitability testing involves percutaneous stimulation of the facial nerve until muscle contraction is observed. The minimal NET determines the threshold stimulation required for muscle contraction compared with the unaffected side. The maximum stimulation test (MST) is a modification of the NET but is a supramaximal stimulus compared with the unaffected side, and the stimulus is increased until the patient encounters discomfort. The subjective nature of the measurements and lack of recorded data limit both methods, and they do not reflect denervation at the moment it is occurring. Electroneurography (ENog) is an objective measure of facial nerve function that measures the amplitude of evoked compound muscle action potentials (CMAPs) with electrodes over the skin of the nasolabial fold. The compound action potential is compared between the 2 sides of the face, and the response of the affected side is expressed as a percentage of the response of the unaffected side. A percentage of nerve fiber degeneration is calculated. A 95% decrease in CMAP compared with the contralateral side signifies a 50% chance that the patient will have unsatisfactory recovery of facial nerve function. Surgery is indicated if a 90% decrease in CMAP is reached within the initial 2 weeks of the onset of paralysis. ENog is objective and is the most accurate reproducible test, but it is expensive and time consuming. EMG is a measure of volitional muscle response that is unlike the other modalities. Needle electrodes are used to monitor activity of the facial muscles. Normal muscle exhibits activity upon needle insertion, electrical silence at rest, and diphasic or triphasic action potentials during voluntary contraction. Fibrillation potentials are observed in the denervated muscle, and polyphasic potentials are observed in muscle undergoing reinnervation. Complete electrical silence is observed in denervated muscle with significant fibrosis. EMG is useful in evaluating patients with acute or traumatic nerve injury and in assessing the viability of the facial musculature when evaluating patients for reinnervation procedures. EMG does not show any signs until 3 weeks after paralysis and should not be utilized until 3 weeks after facial paralysis without any signs of recovery. Objective measures of facial motion include digital photography and video recording of the patient at rest and during motion. Dated visual documentation and preoperative and postoperative facial function are salient for preoperative planning and outcome assessment. One method of objective measurement is the maximum static response assay of facial motion. This method quantifies facial motion preoperatively and serially during the postoperative period. Mark the patient's face and ask him or her to perform region-specific movements, including brow lift, eye closure, smiling, frowning, and whistling or puckering. The images of the face in repose and the maximum response movements are recorded and processed for computer display. The images are calibrated and normalized, and vectors of movement are determined and measured using a grid and an internal facial coordinate system. Even slight improvements in facial movement can be detected over the long recovery periods that often accompany facial reanimation procedures. Patients desire a countenance and visage with a normal or almost normal balance when the person's face is at rest. Objectives of treatment are corneal protection, establishing a normal resting tone, and restoring a symmetrical dynamic smile. 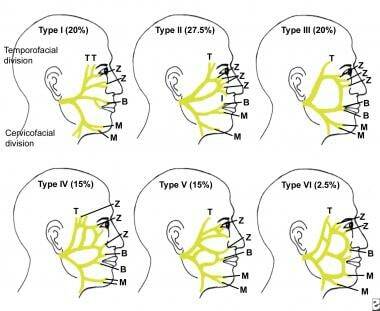 Little information is available on the denervation of human facial muscles. Denervated muscles cannot be voluntarily stimulated and have no response to electrical stimulation. A longer period of denervation translates into a lesser degree of recovery after reinnervation. There is a decrease in efficiency of muscle reinnervation after 12-18 months of paralysis/denervation. Muscles that are reinnervated may not undergo full recovery or respond to regenerated nerves. Repair of the facial nerve is the most effective procedure to restore the function of the face. Repair is indicated in patients who have experienced acute disruption or transection of the nerve from an accident, trauma, resection during extirpation, or inadvertent division during surgery. The most critical factor in achieving good postoperative facial function is early identification and repair of nerve disruption. Several investigators have demonstrated that earlier repair of the facial nerve produces superior results. Some authors report function in patients who were grafted 18-36 months after injury, but superior results are found with repairs performed within 1 year. May advocates repair within 30 days; this recommendation is based on clinical results and neurobiologic investigations that reveal that the regenerative process begins almost immediately following injury. Following axotomy, the nerve cell body immediately undergoes changes in morphology and protein synthesis to support axonal replacement. The proximal portion of the interrupted axon transforms into a growth cone, and, within a few days, axon sprouts push out, seeking the distal motor endplate. Neuron metabolic activity peaks approximately 21 days after injury. The distal portion of the interrupted axon undergoes Wallerian degeneration, and, within 2 weeks, collagen and scar tissue begin to replace axons and myelin in the distal nerve stump. Traumatic nerve injuries must be repaired expediently. In the instance of a grossly contaminated wound (eg, shotgun injury), the nerve ends can be tagged and repaired at a later date. A nerve accidentally transected during surgery (eg, facelift) should be attacked with an end-to-end anastomosis. If the facial nerve is resected because of tumor involvement, frozen sections of both ends can be sent for histopathologic examination to exclude microscopic invasion before attempting repair. When margins are clear, either end-to-end anastomosis or graft repair can be performed immediately. The condition of the nerve at the time of injury dictates whether nerve repair is indicated and whether it will presage functional repair. The condition of the nerve depends on the type of injury or trauma. A patient with preoperative facial palsy secondary to tumor involvement of the facial nerve is unlikely to experience a good result following resection and repair. The amount of functioning nerve fibers existing at the time of surgery does not increase after repair; do not expect improved postoperative facial function over preoperative status. A sharp facial nerve laceration from glass or a knife should be suitable for end-to-end anastomosis. Gunshot wounds, however, either crush or avulse the nerve, which propagates further nerve degeneration/denervation. These injuries should not be repaired in the immediate setting until the extent of the nerve damage has declared itself. In a delayed intervention, scar tissue and neuromas must be removed, and unhealthy nerve ends must be excised. Identifying healthy nerve stumps may necessitate histologic or microscopic confirmation. Matching of the endoneurial surfaces is essential in promoting neural regeneration and is more important than a match of the total nerve diameter. The endoneurium is examined more easily by removing the overlying perineurium at the ends of the nerve. Occasionally, a significant mismatch between proximal and distal nerve ends requires a double cable graft (eg, when grafting from the main facial nerve trunk to segmental branches). Various neurorrhaphy techniques and adjunctive measures have been investigated in attempts to improve neural regeneration, including epineural versus perineural sutures, tissue adhesives, laser neurorrhaphy, tubulization, and trophic factors. However, the most efficacious method of reapproximation remains unproven, and no specific adjunctive measure has been found to be beneficial. The use of a minimal number (usually 2 or 4) of epineural or perineural sutures, employing a fine monofilament suture under microscopic vision, or loupe magnification, remains the time-tested criterion standard for nerve repair. Any tension on the nerve ends after repair results in the formation of scar tissue and poor neural regeneration. Primary neuropathy can be achieved if the proximal and distal facial nerve ends can be approximated without tension. If tensionless nerve repair is not feasible, then a nerve graft (usually the sural nerve) will be interposed between the proximal trunk and distal branches. Mobilization of the nerve may add up to 2cm of relative length but also may result in devascularization and further neural injury. Any defect greater than 2cm should be tackled with a nerve graft. The surgeon must design a nerve graft of adequate length, without any tension and with a small amount of slack when bridging the defect. Cable grafts function as conduits in which sprouting axons from the proximal nerve stump travel to the motor endplates. The graft provides cellular and humoral promoters for neural growth, such as Schwann cells, extracellular matrix, and neurotrophic growth factor. The great auricular nerve and sural nerve are the most commonly selected nerves for facial nerve grafting. Disadvantages include a sensory deficit of the earlobe when using the great auricular nerve or of the lateral foot when using the sural nerve. The great auricular nerve is harvested easily; since it is located near the surgical field in which the nerve repair is taking place, it tends to be a good match in size, and its extensive arborization allows the anastomosis of the proximal facial nerve stump to several segmental branches. However, only 7-10cm of the great auricular nerve can be harvested safely, which limits its use in extensive repairs. The sural nerve is larger, with a greater axonal volume, and up to 35cm is harvested easily from the posterior lower leg. It is especially useful in cross-facial grafting. The principles and technique of graft anastomosis are identical to those of primary repair. The patient should not expect return of facial function following nerve grafting for 4-6 months, as regenerating axons travel a distance of approximately 1mm/day. Improvement in function can be expected for up to 2 years. In general, results after nerve grafting are not as good as those observed with primary repair. Spector et al found incomplete reinnervation of facial divisions, decreased voluntary contractions, and more severe synkinesis when comparing cable grafts to direct end-to-end anastomoses. However, 92-95% of patients who undergo facial nerve grafting experience some return of facial function, and 72-79% have good functional results. After surgery, the rehabilitation of patients with facial paralysis necessitates electromyography (EMG) protocols, behavioral modification, and patient exercises. The patient needs to obtain voluntary control of facial regions. Another adjuvant therapy is the use of percutaneous electrical stimulation to stimulate motor function. Intracranial nerve injury most commonly occurs during resection of an acoustic neuroma or other tumor of the cerebellopontine angle (CPA). Prior to the advent of the operating microscope in 1961, rates of facial palsy following acoustic neuroma removal approached 95%. House, by implementing the use of the operating microscope, reported a 72% rate of normal facial function in patients who underwent tumor resection from 1961-1968. More recently, a 97.7% rate of facial nerve preservation following CPA tumor surgery was reported. In the event of nerve injury in the CPA, immediate repair with direct anastomosis or graft is advocated. Rerouting the tympanic and mastoid segments of the nerve may add enough length for end-to-end anastomosis, but a graft is often required. Interposition grafts can be placed from the intracranial nerve segment to the temporal segment or from the intracranial nerve segment to the extracranial segment, thus bypassing the temporal bone. These repairs are technically difficult. The proximal nerve end, as it enters the brainstem, usually is short and has no epineurial covering. The brainstem is pulsatile, and cerebral spinal fluid constantly flows through this area. Intratemporal facial nerve injury is observed in patients who have experienced external head trauma or iatrogenic injury during otologic procedures. Temporal bone fracture is the most common mechanism of facial nerve injury from external trauma. Most temporal bone fractures result from motor vehicle accidents, and 7-10% of these fractures result in facial nerve dysfunction. In temporal bone trauma, facial nerve injury most often occurs in the perigeniculate and labyrinthine areas, with axonal degeneration extending a variable distance, possibly involving the entire intratemporal length. Management of facial nerve injury following temporal bone trauma remains controversial. However, a review of the literature concludes that patients with complete paralysis at the time of injury have a poorer prognosis than those with incomplete or delayed paralysis. Chang and Cass proposed a reasonable algorithm for the management of intratemporal facial nerve injury from temporal bone trauma, in which patients with delayed onset or incomplete paralysis are observed. If the paralysis progresses to complete paralysis, perform serial ENog. In addition, monitor patients with immediate complete paralysis with serial ENog. If ENog shows greater than 95% degeneration in the first 14 days after injury, offer the patient facial nerve exploration and decompression. Explore the entire length of the nerve from the meatal foramen to the stylomastoid foramen. Perform nerve repair via primary anastomosis or graft only if total or near-total transection is certain. Green et al also reported injury of the facial nerve during tympanoplasty alone and during removal of exostoses. Patients with previous surgery, infection, tumor, or congenital anomalies of the ear are at a higher risk for inadvertent nerve injury. If the injury is recognized immediately, repair it during the primary procedure. Explore a postoperatively recognized facial paralysis that does not recover over several hours. Monitor a delayed-onset paralysis with serial ENog and explore if more than 90% degeneration occurs within the first week. Strongly consider nerve repair if more than 50% of the nerve is transected. Extratemporal injury to the nerve may occur during surgery of the parotid or submandibular gland, temporomandibular joint procedures, or facelift procedures, or from traumatic lacerations of the face. Paralysis of the facial nerve following uncomplicated parotid procedures is reported at a 20% rate of temporary palsy, with a 10% rate of permanent paresis of temporal or mandibular branches. Children are at higher risk for facial nerve injury during parotid surgery, as are patients who undergo total parotidectomy. Surgery of the parotid gland often is performed for benign or malignant tumors that may involve the facial nerve. If the nerve is resected because of a tumor, histopathologic confirmation of clear margins is required prior to repair by direct anastomosis or graft. Inadvertent transection recognized during facelift or parotid surgery warrants immediate primary repair. Postoperative paralysis with known facial nerve integrity usually recovers within 6 months of the procedure. Traumatic transections, iatrogenic injuries, and division of segmental branches proximal to the lateral canthus should be explored and repaired. Facial nerve injury following submandibular gland surgery, which usually involves the marginal mandibular branch of the nerve, is not uncommon. Sacrifice of this branch may be unavoidable because of involvement by the disease process, most commonly chronic infection or tumor. Temporomandibular joint procedures may injure the temporal branch or, less commonly, the main trunk of the facial nerve. Facial nerve injury during rhytidectomy is rare, usually temporary, and most often involves the segmental branches. The surgeon is obliged to explore traumatic or iatrogenic transections that involve the main trunk of the facial nerve and repair them as soon as they are recognized. The surgeon should explore and repair segmental branches proximal to the lateral canthus and nasolabial fold. Medial to the lateral canthus, extensive interconnections between the zygomatic and buccal branches provide neurotization of denervated muscle and satisfactory functional recovery. Nonetheless, the surgeon should also explore and repair medial temporal and marginal branch injuries, if possible. Nerve substitution via grafting or nerve transfer should be achieved in patients with facial paralysis who lack the proximal nerve segment but have an intact distal neuromuscular pathway, including an intact distal segment of nerve and facial musculature suitable for reinnervation. A donor nerve, transferred and anastomosed to the distal facial nerve stump, innervates the facial muscles in place of the injured proximal facial nerve. The spinal accessory, phrenic, and trigeminal nerves have been used in nerve transfer procedures. However, sacrificing these nerves involves significant morbidities. Therefore, the hypoglossal nerve transfer/graft and cross-facial grafting have remained the mainstays in treatment. Eighteen months after the original nerve injury, the facial muscles atrophy and do not regain any modicum of function. When the interval of facial nerve dysfunction is less than 18 months, primary repair, nerve grafting, or nerve transfers can be explored. Denervated facial musculature undergoes atrophy immediately after nerve injury and takes several years to complete. If the status of the facial musculature is in question, the team should perform electromyography (EMG), muscle biopsy, or both prior to the reinnervation procedure. Several factors must be considered when selecting patients for nerve substitution. The availability of the distal neuromuscular unit is the most essential requirement for this technique. Unavailability of the proximal facial nerve segment most commonly occurs following cerebellopontine angle (CPA) surgery, in which the nerve is resected at the brainstem. It also occasionally occurs following radical or ablative procedures for tumors of the parotid gland, temporal bone, or skull base. The surgeon must evaluate the distal neuromuscular unit. Denervated facial musculature undergoes atrophy and eventual fibrosis in a process that begins immediately after nerve injury and takes several years to complete. As stated above, if the status of the facial musculature is in question, perform EMG and muscle biopsy prior to the reinnervation procedure. The distal nerve stump also undergoes degeneration, as previously described, and severe neurofibrosis may limit axonal regrowth. Nerve transfer always results in either total or partial loss of function in the donor nerve, depending on the technique used. Hypoglossal substitution results in paralysis or weakening of the ipsilateral tongue muscles, which may result in significant problems with speech, mastication, and swallowing. Korte performed the first hypoglossal-facial nerve anastomosis in 1901. May reports improvement of tone and symmetry in more than 90% of patients who undergo this procedure. Initial results usually are observed within 4-6 months, indicating the amount of time necessary for axons to travel to the distal motor endplate. Voluntary movement develops and continues to improve for up to 2-3 years. Spontaneous, symmetrical movement is unlikely following this type of procedure. Patients must undergo biofeedback and motor sensory reeducation to learn voluntary control of movement, decrease synkinesis, and limit facial grimacing that can occur with mastication. The team evaluates function of the facial nerve following hypoglossal-facial anastomosis by the degrees of tone, symmetry, movement, and synkinesis exhibited rather than by the traditional House-Brackmann scale. A review of several large series of patients found that 42-65% of patients experienced good to excellent results, which were described as the presence of tone and symmetry, with fair to good movement and moderate to mild synkinesis. Complications following hypoglossal-to-facial anastomosis include variable degrees of hemitongue atrophy and functional disability, including difficulty with chewing, swallowing, and speaking. In general, these impairments improve over time, and many patients report fewer problems chewing postoperatively than preoperatively. This likely is due to improvement of buccal tone. A partial hypoglossal-to-facial nerve transfer using a jump graft can reanimate the facial muscles while curbing the complications of complete hypoglossal sacrifice. In this technique, a cable graft is anastomosed in a notch in the hypoglossal nerve and attached to the intact facial nerve stump using microsurgical principles. Facial motor function generally is not as strong following a jump graft, and recovery of facial function has been found to take longer in jump grafts. Smith and Scaramella first reported cross-facial nerve grafting in 1971. This technique provides the potential for symmetry and involuntary mimetic function. Disadvantages include weakening of the contralateral facial nerve and inadequate power to innervate the ipsilateral musculature. Cross-face nerve grafting is indicated if the proximal ipsilateral facial nerve is not available but the distal stumps are available. Outcome of cross-nerve grafting depends on timing and technique and can provide the best facial reanimation scheme if performed on the right patient. The surgeon must select appropriate segmental branches of the contralateral facial nerve as donors, with the sural nerve serving as a cable graft. Many techniques have been described, such as a single segmental-to – main trunk anastomosis and multiple anastomoses from segmental branches to segmental branches. The grafts are tunneled above the supraorbital ridge for the orbicularis oculi, the upper lip for the zygomatic and buccal branches, and below the lower lip for the marginal mandibular branch. Facial muscle movement will not emerge until 9-12 months after the procedure (ie, the allotted time for axonal growth to cross the graft). Cross-facial nerve grafting remains polemic, and many investigators relegate it to serving an adjunctive procedure in combination with other reanimation strategies. When facial nerve dysfunction has exceeded 18 months, dynamic slings and free muscle transfers can be executed to restore facial and oral motor function. Severe neurofibrosis and myofibrosis in the distal neuromuscular unit preclude successful reinnervation. Patients with congenital facial paralyses cannot be reinnervated, since the neuromuscular units never developed in these individuals. Regional muscle transposition and free-muscle transfer are the 2 modalities to reanimate the face in this subset of patients. Regional muscle transfer can reanimate the lower third of the paralyzed face. This new neuromuscular unit is composed of the transferred muscle (to its new origin) with its original nerve and vascular supply. The temporalis muscle may improve the symmetry of the commissure of the mouth and reestablish a voluntary smile. The vector of the temporalis muscle resembles that of the zygomaticus major and, thus, results in a lateral smile. Transposition will not produce spontaneous mimetic function. Each movement necessitates a specific volitional action, in which the patient must consciously contract the transposed muscle in conjunction with the smiling. Temporalis muscle transposition can also reanimate the eyelids. However, reanimation of the eye with the temporalis transfer can produce eyelid distortion. To avoid a contour defect, do not use the muscle anterior to the hairline. The temporalis muscle is harvested through a vertical incision in front of the ear that extends to the scalp. The middle section of the muscle and fascia is elevated and detached superiorly from the skull while the inferior attachments are preserved. Two tongues are created by bisecting the muscle, and the muscle is tunneled through a subcutaneous pocket from the zygomatic arch to the vermillion border. The ends of the temporalis are secured to the orbicularis and the corner of the mouth. The ends should be secured with enough tension to create some level of overcorrection. The patient initiates a smile by consciously tensing the temporalis muscle. Patients will require therapy to master this technique. In his study, May reported improvement in 95% of patients with temporalis transfer for lower-face reanimation and good to excellent results in 78% of patients. The complication rate was 18%; the most common complications were infection and implant-related complications. Other potential complications include failure of attachment, pulling away of the temporalis muscle from the commissure, and overcorrection of the upper lip. The transfer may also generate excess muscle bulk and a facial deformity, particularly over the zygoma. The masseter muscle is another muscle used for reanimation of the commissure of the mouth, either alone or in conjunction with the temporalis. Unlike the temporalis, the vector of smile of the masseter muscle is in the buccinator-risorius direction, which produces a less natural smile. The smile is one of the most important facial expressions, and facial paralysis can debilitate an individual. Conley developed the modern method of transposing the tendon of the digastric muscle to the orbicularis of the lower lip. The blood supply and nerve to the anterior belly remains intact, and dynamic depression of the lower lip border is achieved. Of 36 patients treated in this manner by Conley, 33 were reported to have satisfactory results. This method is ideal for isolated palsy of the marginal mandibular nerve only, since it can create oral incompetence in patients with more extensive palsy of the lower face. Depressor muscle function is important to dentured smile, as well as to expressions of sadness, anger, and sorrow. The lower lip is animated by interactions of the orbicularis oris, depressor labii inferioris, depressor anguli oris, mentalis, and platysma. Terzis described a technique to improve this type of smile by transfer either of the anterior belly of the digastric tenor or of the platysma. Other authors argue that this symmetrical smile could be achieved with less invasive approaches, including BOTOX® injections or myectomy of the depressor labii inferioris. Regional muscle transposition is limited by anatomic constraints of size and vectors and often produces results slightly better than static strategies. Regional muscle procedures are appropriate in patients who are in poor health or who will not survive beyond the 12-24 month period of neurotization of a free muscle transfer. Such procedures provide immediate reanimation and are technically less demanding than cross-facial nerve grafting with free muscle transfer. Cross-facial nerve grafting with microneurovascular muscle transfer is the best strategy for facial reanimation when a patient has long-established facial paralysis (>24mo). Other approaches leave residual asymmetry, an unnatural appearance, and unwanted facial movements while eating. The advent of microsurgical technique and free-muscle transfer introduced a new era for facial reconstruction in patients with chronic facial palsy. Free-muscle transfer supplies a new neuromuscular unit to the face via a free-muscle flap and a grafted donor cranial nerve, usually a cross-facial nerve graft. This modality establishes more precise vectors in addition to spontaneous mimetic facial expression. Most commonly, the surgeon executes a 2-stage technique of cross-facial nerve graft followed by a delayed free-muscle transfer. The rationale for the delay is to prevent atrophy of the muscle graft while waiting for axons to travel the length of the nerve graft. Occasionally, the proximal segment of the ipsilateral facial nerve is available for grafting to innervate a free-muscle transfer. This situation most commonly occurs in the event of a failed interposition nerve graft, resulting in facial musculature that no longer can be reinnervated. The contralateral facial nerve is chosen as the donor nerve, and a redundant zygomaticus branch is selected for grafting. The hypoglossal nerve also can act as a donor, either by a direct or jump graft alone or in conjunction with a cross-facial graft. The sural nerve is anastomosed to the contralateral facial nerve or substituted cranial nerve and tunneled subcutaneously from the donor nerve to the planned site of free-muscle transfer, and the distal segment of the graft is tagged. The ideal time for the muscle transfer occurs when a Tinel sign is detected in the distal nerve end, indicating completion of axonal growth. Free-muscle transfer is usually performed 9-12 months after nerve graft. A plethora of muscles have been assiduously investigated for free transfer to the paralyzed face, including the gracilis, serratus, pectoralis minor, latissimus dorsi, platysma, rectus abdominis, rectus femoris, and extensor digitorum brevis. The original report by Harii in 1976 of free-muscle transfer for facial paralysis described use of the gracilis muscle. It remains the muscle of choice because of its relative ease of dissection, adequate neurovascular pedicle, and muscle fiber length, which corresponds to the action of the zygomaticus major muscle. The vascular pedicle is derived from the medial femoral circumflex artery and provides up to 8cm of length. Innervation of the gracilis is provided by the anterior branch of the obturator nerve, which can be dissected to a length of 10-12cm. During the second-stage procedure, the surgeon must identify the distal end of the nerve graft and send a frozen section for confirmation of viable axons. The muscle flap is harvested and transferred to the face. The flap is secured to the periosteum of the zygomatic arch and the modiolus in a vector that corresponds to the smile on the contralateral face. Subsequently, the microanastomosis between the flap and recipient vessels is executed, followed by the nerve anastomosis as close to the muscle as possible. Movement can be expected in 6-9 months, with improvement over the following 2-3 years. Based on their anatomical findings, Lifchez and Gasparri endorse the serratus anterior for free-muscle transfer. Each serratus slip, divided along fascial planes, can generate a distinct force vector for facial reanimation, with a total of 5 slips and 10 subslips. This serratus anterior can, therefore, be used as a single donor muscle with multiple vectors of action and multiple functions (eg, restoration of a symmetrical smile with simultaneous, but independent, eyelid closure). Terzis and Noah found no significant effect associated with age, gender, or ischemia time on outcome in their series of 100 free-muscle transfers. They reported moderate or better results in 80% of patients undergoing free-muscle transfer, based on a 5-step scale of judgment. In their study of 25 patients, Kumar and Hassan compared single-stage free-tissue transfer with dual-stage free-tissue transfer for facial reconstruction. The gracilis obturator nerve branch can yield a length of 12cm, which allows primary anastomosis of this nerve to the contralateral facial nerve. However, this technique produces an additional scar on the cheek. The single-stage transfer has fewer complications and a reduced recovery time with decreased rehabilitation, but the dual-stage approach achieves better overall symmetry. In their investigation of 166 free gracilis transfers, Manktelow and Zuker explored muscle transfer with cross-facial nerve graft versus single-stage transfer to the masseter nerve. The excursion of the free gracilis innervated by the masseter nerves is greater than that of the cross-facial nerve graft. This is probably attributable to the different motor nerve used to reinnervate the muscle. The cross-face nerve graft provides improved spontaneity in terms of movement, which is vital to a normal smile in children. This is a more important characteristic than degree of excursion. Their future studies will explore the nature of spontaneity in their muscle transfers utilizing the masseter nerve as a donor. Although use of the masseter nerve with free-tissue transfer was previously explored and considered only in the setting of Möbius syndrome, bilateral facial paralysis, and facial paralysis not suitable for cross-facial nerve grafting, the masseter nerve’s applicability and role has been recently extended to patients with unilateral facial palsy. This one-stage strategy, incorporating the masseter nerve with free tissue transfer, has become a reasonable alternative (and may become the criterion standard) to the dual-stage approach with cross-facial nerve grafting. The enormous advantage of the masseter nerve free-tissue transfer technique is that, unlike the cross-facial nerve, the masseter nerve donor produces a movement and muscle excursion (in relation to smile and commissure excursion) in normal range with consistent movement. Also, this technique obviates the need for a second operation. Takushima and Harii determined that predicting muscle bulkiness to obtain symmetry of facial contour is difficult during the initial free-muscle transfer. In their study of a patient population of 486 patients and 183 revisions, Takushima and Harii analyzed excessive muscle bulk and dislocation of the transferred free muscle. Their report illustrated the wide gamut of revisions, including muscle debulking of cheek, adjustment of tension and attachments of transferred free muscle, and lipoinjection to the cheek for better volume symmetry. Möbius syndrome involves bilateral facial nerve paralysis and can often attack cranial nerves VI, III, and XII. The syndrome generates psychological disability due to lack of facial animation and lack of emotional expression. Patients with an immobile face cannot use it to show happiness, sadness, or anger. The surgical goals for patients with Möbius syndrome are far more modest than and differ from the goals for patients who have unilateral developmental facial paralysis. The restoration of a true smile in these masklike faces is impossible. Movement can be restored along only 1 vector. A detailed neurologic evaluation can identify possible motor donors or residual function, which can be used for additional dynamic restorations. Because of cranial nerve involvement, a thorough clinical and electrophysiologic examination is obligatory. Most frequently, the reconstructive surgeon performs free-tissue transfers with bilateral gracilis muscles anastomosed to the masseter nerves on both sides in order to achieve smile restoration. The patient with facial paralysis presents a daunting challenge to the reconstructive surgeon. A thorough evaluation, including complete history and careful physical examination, directs the surgeon to the appropriate treatment modality. Dynamic reanimation involves nerve repair, nerve transfer, regional muscle transfer, or free-muscle transfer. None of the procedures can restore all of the complex vectors and balance of facial movement and expression. However, dynamic reconstructive techniques can yield improved facial symmetry, spontaneous and symmetrical smile, eye closure and protection, and oral competence, all of which refurbish patients' emotional, psychological, and cosmetic state and disabilities. Robey AB, Snyder MC. Reconstruction of the paralyzed face. Ear Nose Throat J. 2011 Jun. 90(6):267-75. [Medline]. Meltzer NE, Alam DS. Facial paralysis rehabilitation: state of the art. Curr Opin Otolaryngol Head Neck Surg. 2010 Aug. 18(4):232-7. [Medline]. Dingman RO, Grabb WC. Surgical anatomy of the mandibular ramus of the facial nerve based on the dissection of 100 facial halves. Plast Reconstr Surg. 1962 Mar. 29:266-72. [Medline]. Hohman MH, Hadlock TA. Etiology, diagnosis, and management of facial palsy: 2000 patients at a facial nerve center. Laryngoscope. 2014 Jul. 124 (7):E283-93. [Medline]. Peitersen E. The natural history of Bell's palsy. Am J Otol. 1982 Oct. 4(2):107-11. [Medline]. Spector JG, Lee P, Peterein J, Roufa D. Facial nerve regeneration through autologous nerve grafts: a clinical and experimental study. Laryngoscope. 1991 May. 101(5):537-54. [Medline]. House WF. Acoustic neuroma. Case summaries. Arch Otolaryngol. 1968 Dec. 88(6):586-91. [Medline]. Arriaga MA, Brackmann DE. Facial nerve repair techniques in cerebellopontine angle tumor surgery. Am J Otol. 1992 Jul. 13(4):356-9. [Medline]. Green JD Jr, Shelton C, Brackmann DE. Iatrogenic facial nerve injury during otologic surgery. Laryngoscope. 1994 Aug. 104(8 Pt 1):922-6. [Medline]. Korte W. Ein Fal von Nerven Fropfung: des Nervus facialis auf den Nervus hypoglossus. Dtsch Med Wochenschr. 1903. 29:293. Schaitkin BM. Nerve substitution techniques: XII-VII hook-up, XII-VII jump graft, and cross-facial graft. May M. The Facial Nerve: May’s Second Edition. New York: Thieme Medical Publishers; 2000. 611-33. Hontanilla B, Rodriguez-Losada G. Bilateral reconstruction of smile through muscular transplants neurotized to masseter nerves. J Craniofac Surg. 2011 May. 22(3):1099-100. [Medline]. Terzis JK, Kalantarian B. Microsurgical strategies in 74 patients for restoration of dynamic depressor muscle mechanism: a neglected target in facial reanimation. Plast Reconstr Surg. 2000 May. 105(6):1917-31; discussion 1932-4. [Medline]. Lifchez SD, Gasparri MG, Sanger JR, et al. Serratus anterior in vivo contractile force study. Plast Reconstr Surg. 2005 Sep. 116(3):839-45. [Medline]. O'Brien BM, Pederson WC, Khazanchi RK, et al. Results of management of facial palsy with microvascular free-muscle transfer. Plast Reconstr Surg. 1990 Jul. 86(1):12-22; discussion 23-4. [Medline]. Kumar PA, Hassan KM. Cross-face nerve graft with free-muscle transfer for reanimation of the paralyzed face: a comparative study of the single-stage and two-stage procedures. Plast Reconstr Surg. 2002 Feb. 109(2):451-62; discussion 463-4. [Medline]. Liu AT, Lin Q, Jiang H, et al. Facial reanimation by one-stage microneurovascular free abductor hallucis muscle transplantation: personal experience and long-term outcomes. Plast Reconstr Surg. 2012 Aug. 130(2):325-35. [Medline]. Takushima A, Harii K, Asato H, Momosawa A. Revisional operations improve results of neurovascular free muscle transfer for treatment of facial paralysis. Plast Reconstr Surg. 2005 Aug. 116(2):371-80. [Medline]. Bae YC, Zucker RM. A comparison of commissure excursion following gracilis muscle transplantation for facial paralysis using a cross face nerve graft versus the motor nerve to the Masseter nerve. Plastic and Reconstructive Surgery. 2006. 117 (7):2407-13. Frey M, Giovanoli P, Tzou CH, Kropf N, Friedl S. Dynamic reconstruction of eye closure by muscle transposition or functional muscle transplantation in facial palsy. Plast Reconstr Surg. 2004 Sep 15. 114(4):865-75. [Medline]. Lifchez SD, Matloub HS, Gosain AK. Cortical adaptation to restoration of smiling after free muscle transfer innervated by the nerve to the masseter. Plast Reconstr Surg. 2005 May. 115(6):1472-9; discussion 1480-2. [Medline].